I finally have my work table set up after moving, and it’s not 100% yet but usable space again! I decided to take a little time out and do a project for myself (rather than commissioned work) which I haven’t done in a long time. Having done lots of those decorative drawings in my sketchbook lately, I decided I’d like to try a really nice version for myself. 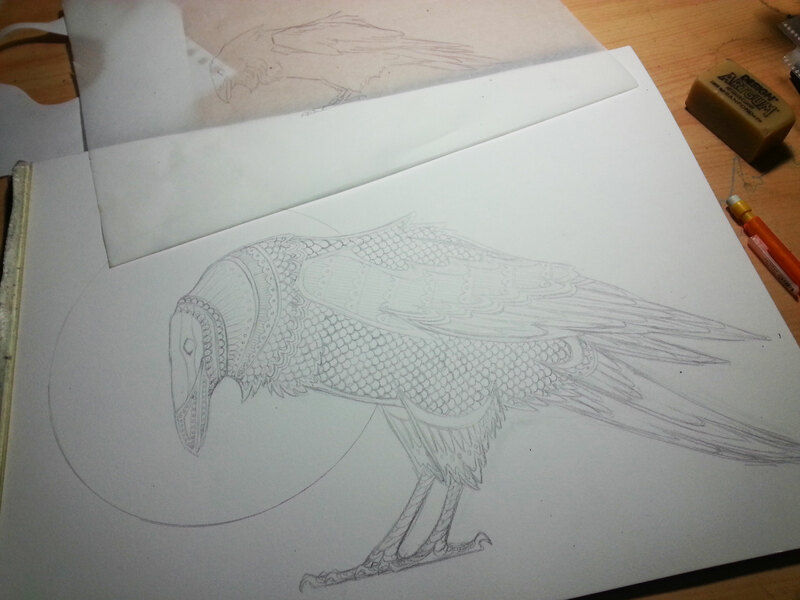 I settled on doing a raven, ’cause they’re the coolest ever. Oh! 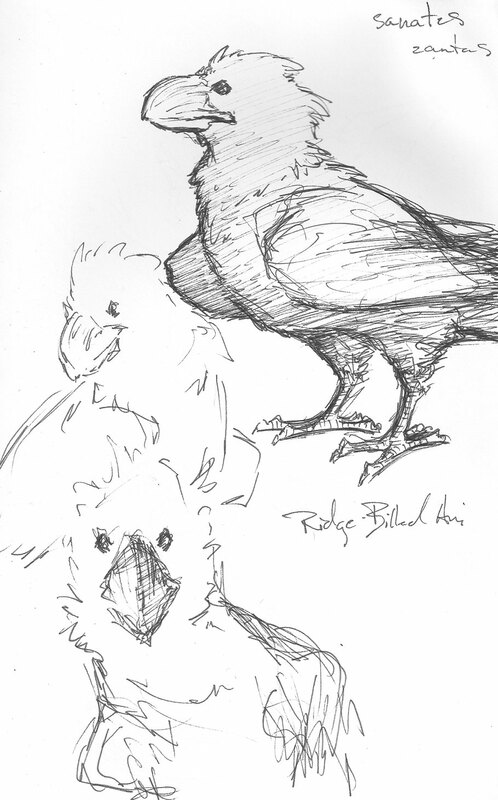 And I also started out by drawing a realistic raven from a photo, just to get the form right. I did him on a scrap of tracing paper that I had, then drew an enlarged version onto the bristol. I tweaked the drawing of the full-size version to make it more symmetrical, then started in on the interior details, still in pencil. There’s just something about the mindlessness of decorative work that I love. Now, that’s not to say that there isn’t quite a lot of thought going into the work. There needs to be concept, creativity, construction and… composition (that’s a lot of ‘C’s). The piece needs to be not just detailed, but attractive and balanced. However, there is a certain “zen” that goes with the type of concentration involved in the repetitiveness of decorative design. I can lose myself in it for hours, so I use it as a time-sucking tool! When I’m getting ready to go on long flights, part of my packing process is to start the outline idea of one or two decorative sketches. If I’m bored on the plane, there is nothing better than to loose myself in one. Here is one from my latest round trip flight. I was talking to one of my best friends several years ago, about doing a collaboration piece for an upcoming convention where we’d both be selling. 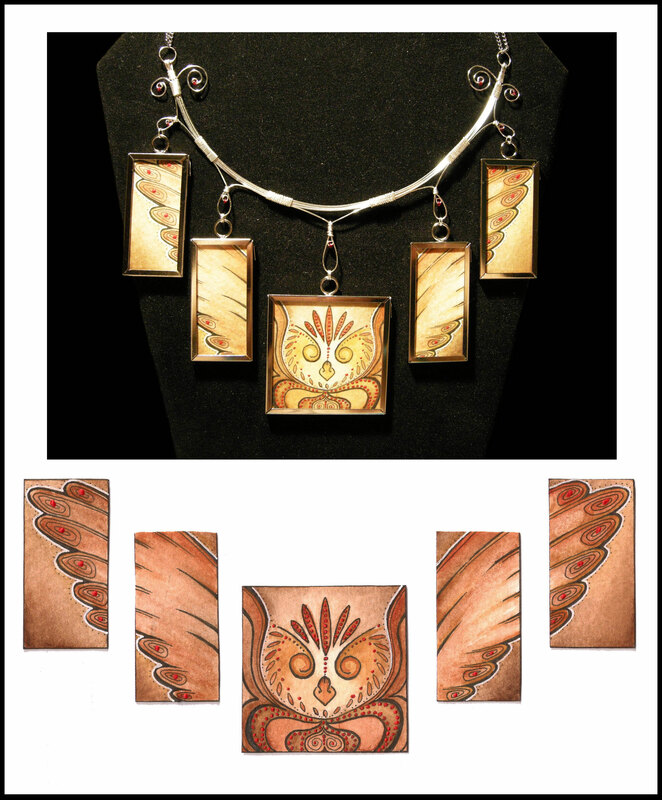 She is an amazingly talented jeweler and textile artist and I had always wanted to find a way to combine our skills somehow. It was a little bit of a challenge considering how different our mediums are… but two pieces of pie and three pots of coffee later we had sketched up a very cool idea. My part was five small connecting watercolor paintings of an owl, which I then gave to my friend. She somehow (I have no idea how she does what she does!) turned them into a necklace using beautiful delicate woven silver with teeny tiny little red beads for accents, to match the accents in the painting. There are these really funny birds that hang around the house every now and then. They’re obviously pretty intelligent, they get into everything and I’ve even seen them playing a few times. I heard an odd noise coming from a some boxes full of old wood pieces one day, and when I looked a bit closer it was one of these guys swinging on a broken wooden leg. He’d swing upside down and toss some of the wood bits below him from side to side, then swing right side up again, much like the way parrots play sometimes. They also have a really interesting look to them. 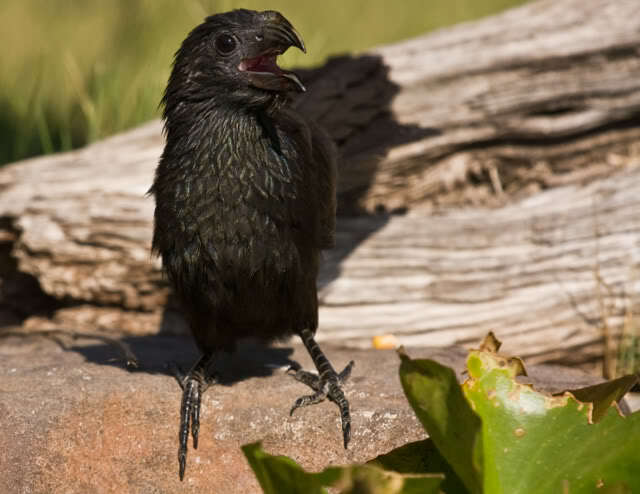 They’re shaped a lot like a black bird or grackle, but their beaks are enormous and take up most of their face! 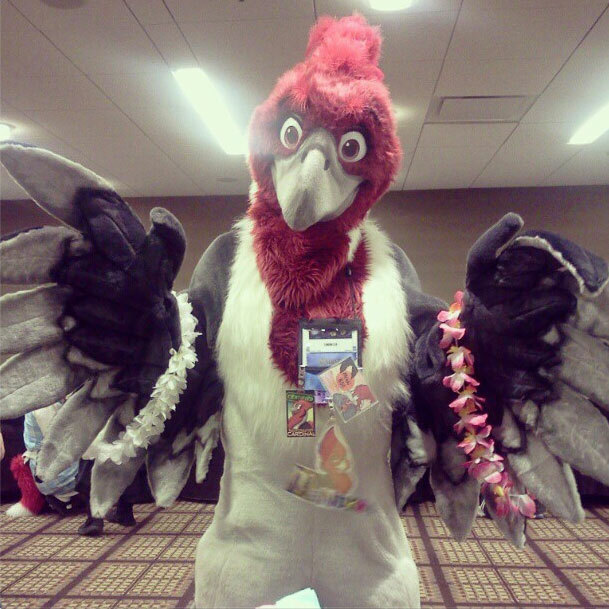 Also, they can easily fly, but I’ve noticed they prefer to run along the ground when they can. They lift their wings up a bit, put their heads down low and sprint and hop along. The first time I saw them their was a small group of them doing just that between the razor wire on the fence outside. That, plus the fact that they’re all black, makes them look just like ninjas on a mission. I went on a mission to find the name of these birds, but no one I asked seemed to know much about them. The locals around here call them “Sanates” or “Zantas”, but I think that’s used as a generic term for small black birds. After a few frustrating hours on the internet and about a hundred google searches later I finally found them. They’re called Ridge (or Groove?) 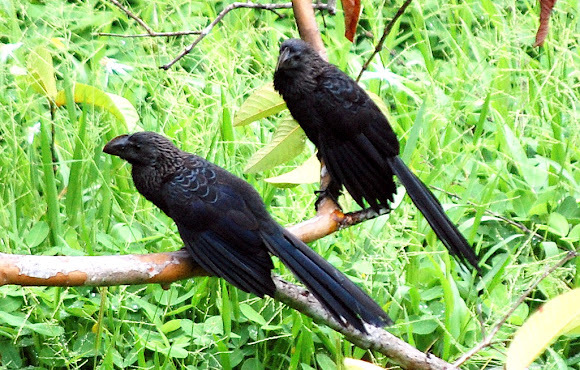 Billed Ani’s. Unfortunately I don’t know much more about them than their name, but here’s a good image I found of two of them, since my sketch is so sloppy. Did you notice their feet?? Two toes in front and two in back! I like to watch lots of weird blogs and lists that post images of random… oddness, and one of the ones I watch is the Carnies and Geeks Tumblr. They post some majorly weird stuff sometimes, but it’s always interesting. 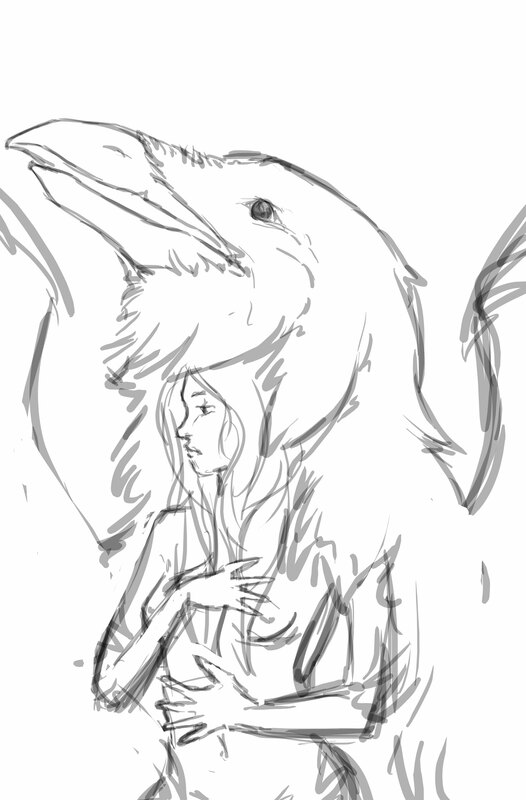 A while back they posted an image of a woman with a bird’s head costume and it was such a cool concept I had to sketch this out. It’s super rough and the wings look wonky, but the finished version will have her hair and skin turning into the feathers of a raven. 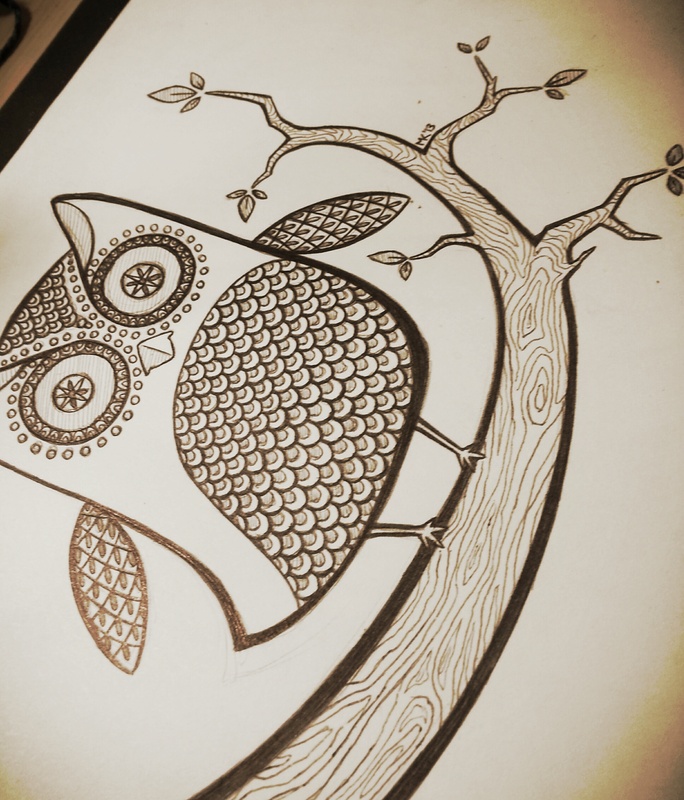 Eventually I want to do a whole series of people turning into their Spirit Animals… I’m thinking wolf, bear and dear. Maybe a seal? Selkies are very cool creatures and I don’t see nearly enough of them around.